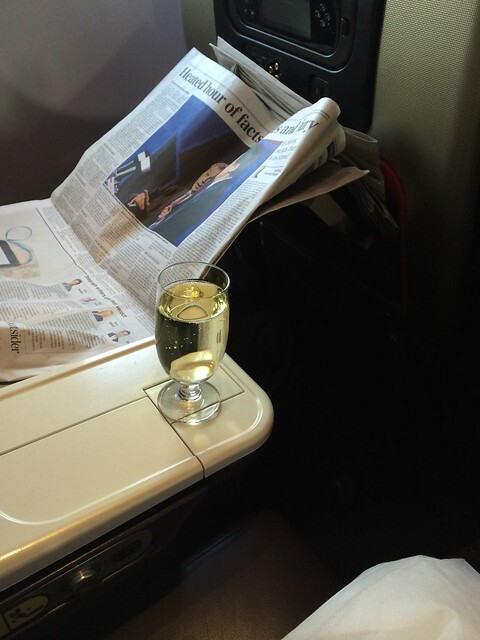 A Review of Virgin Atlantic's Premium Economy: Is It Worth the Extra Money? 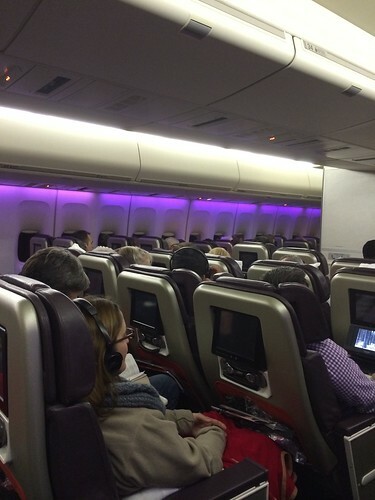 Home > Travel Tips > A Review of Virgin Atlantic’s Premium Economy: Is It Worth the Extra Money? 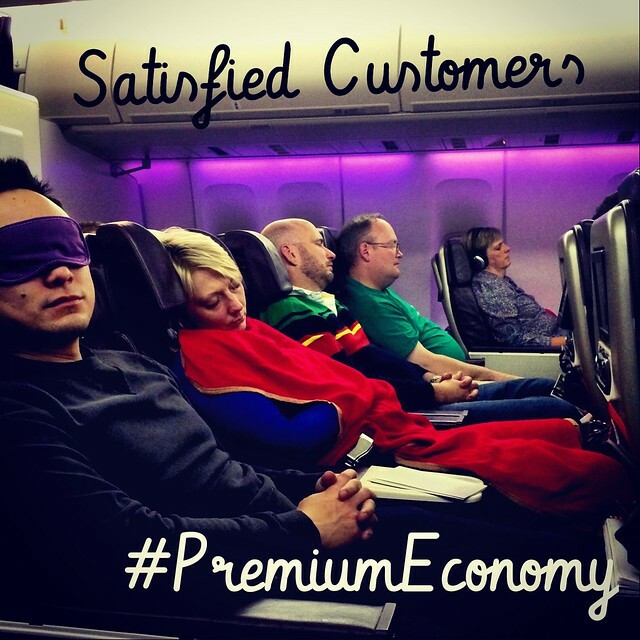 A Review of Virgin Atlantic’s Premium Economy: Is It Worth the Extra Money? If you’re a regular reader of this blog you know that while I’m obsessive with luxury when it comes to travel, I usually (sadly) fly Coach. It’s just too big of a difference in price for such a short part of my vacation to justify spending the money ($10,000 vs. $1,000 often) or the miles IMHO. So I suffer through economy class (yes, even on my honeymoon) so that I can spend that money once I’m in my destination on hotels and restaurants. Seriously the money I save on not upgrading can almost cover my entire trips. When I heard about Virgin Atlantic’s Premium Economy though I was intrigued. The idea that I could pay a fraction of a First Class fare for some of the added benefits? Yes, please! Virgin offers 3 classes of service between New York (JFK) and London: Economy, Premium Economy and Upper Class. On my most recent trip to London (I was part of a blogger’s trip through Visit Britain) I was offered the chance to fly Premium Economy–and they were paying so what did I have to lose? What I found is that a little goes a long way! While Premium Economy isn’t quite Upper Class–for instance the seats don’t fully recline and you can’t sit at the awesome bar, there are several little things that in my opinion make it a nice little upgrade if you have a few extra hundred dollars (or miles) to spare but can’t quite stretch to Upper Class prices. Premium Economy to me is a nice way to make international flights more bearable without blowing your entire vacation budget. The experience is similar to what a business class experience would be. There are a few dedicated counters for Premium Economy flyers. They had shorter lines than economy and were very quick. They also tag your bag with a Premium Economy tag, which made me feel like my luggage had a higher chance of reaching my destination. When possible your bags are the first off the plane. And this really was true. I saw all the Upper Class bags come out first and then Premium Economy followed. This is a huge perk to me because you can beat most passengers to the customs line and save yourself some time. Next, (at JFK at least) I was able to wait in the security line with the First Class passengers, which I thought was a major perk. The economy line at JFK seriously was about ten times the size. The boarding process was similar to Upper Class, though they have their own entrance. But, Premium Economy was able to board with Upper Class before Economy. I never understood this perk though, I have no need to be on the plane earlier. My favorite part of the boarding experience (I’m sure you’ll all be surprised to hear) was the complimentary welcome glass of bubbly. Yes, please! The Premium Economy seating layout on my way out was 2-4-2 and on the return it was 2-3-2. This is an upgrade from a 3-4-3 or a 2-4-2 layout in Economy. It’s not quite a Business Class configuration though, which would be a 2-3-2 or 2-2-2 on comparable aircrafts. That said though, the little bit of extra room makes a pretty big difference. The seats themselves were purple leather–leather! Such a selling point for me. This way I could take out my little wipe and feel like everything was good (and sanitary) as new. I felt kinda like I was sitting in a big arm chair. They were definitely better than any Coach seat I’ve experienced. The seats did not fully recline but they did lean back quite a bit further than Coach. So much so that when I reclined my seat as far as it would go the woman behind me freaked out and asked me to lean it up. I begrudgingly agreed to put it up (but then proceeded to lower it back down a little at a time). There are foot rests that come out of the seat in front of you, which I found to be really helpful for keeping pressure off my back. They also had foot rests for those without seats in front of them that they took down during the flight. In addition to the recline button there was also a button for lumbar support–I couldn’t really see a difference from fiddling around with it though. The power situation was somewhat disappointing–on the website they advertise that the Premium Economy seats offer laptop power. However, in order to take advantage of this you need to purchase a pricey (nearly $100 USD) adapter. I think that there should be a regular outlet (especially considering Virgin America offers this in every seat). However, there is a USB outlet that you can use for charging as long as you are using the device you have plugged in. You can’t just put something in to charge, as this is a fire safety concern, which seems fair enough. There are individual screens in the seat in front of you. The entertainment selection was fabulous. There is an excellent selection of (inclusive) movies and TV shows. There were many movies that had just been released to DVD, including the recent Oscar winning films and nominees so I was quite pleased to sit back and relax. 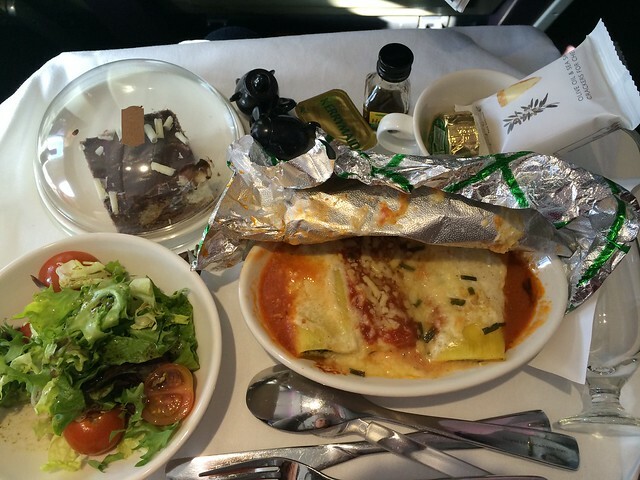 Okay, so it’s airplane food–I didn’t have particularly high expectations but both meals I had were pretty good (again for airplane food, I’m not comparing it to New York restaurants). In Premium Economy there were three choices, including one vegetarian option (no choice for appetizer or dessert). The vegetarian for me is always the best, it’s simple and no fuss (but again I have vegetarian tendencies so take it for what it’s worth). The meals are served on china with stainless steel cutlery, which makes you feel a little more like a person and a little less like cargo. Score. The wine was pretty good too. Not sure what they served in Economy but I was quite satisfied. And then they served an after dinner liqueur, which I thought was a classy touch. The outbound flight to London didn’t really serve snacks because most people are sleeping (I was on the 10PM out of JFK) but on the way back they came around a few time with little treats like popsicles, tea and candy. In addition to a pillow and blanket, Premium Economy passengers were given an amenity kit on outbound flight (it’s given on all night flights). It comes in a cute little wallet and contained essentials for a great flight like a toothbrush, toothpaste, sleepmask, purple (signature color) socks and earplugs. I think it could use a face wipe but I was pretty pleased. I thought this was a nice touch and really made me feel like I was part of an upgraded experience. The service was great, I found that there were always attendants going up and down the rows either with snacks or to take garbage. You have a dedicated bathroom that you share with the Upper Class passengers. Again, this made me feel truly upgraded. I especially loved the soap/lotion in the bathroom. It was Cowshed brand and every time I left the bathroom I swear I just kept smelling my hands. It was a grapefruit and something hand soap (kicking myself now for not writing it down). So there you have it. I think that if you can find Premium Economy tickets for just a few extra hundred dollars that it’s totally worth it for a long, international flight. For more information visit Virgin Atlantic online. As I mentioned in the first paragraph my flight was paid for courtesy of Visit Britain and Virgin Atlantic. However, I am not being compensated to write this post in any way. I just wanted to share my wisdom. And as always, you can’t buy the love here! If you’re flying long haul, I’d say it’s definitely worth it – for the legroom alone. That little bit of extra legroom and the ability to recline your seat gives you a lot more chance to get some shut eye and arrive refreshed. That alone is worth the extra for me. Yes! Am dying to try upper class!!!! Next time for sure!!! I was dying to get to that bar! Totally agree! Such a big difference! And I agree, that sleep mask is my favorite thing! Yes, I’m sure! I feel your pain! I had been looking for information regarding the premium economic flights by Virgin. The post you have shared is great. The pictures you have shared shed light to the information you have provided. Great work pal. I am sure many folks will be thankful to you for sharing this post. Have just flown Premium economy and found the choice menu a joke. On both outgoing and return journey there was no choice it was chicken or vegetarian and no beef again. Poor salad and poor breakfast – both of us had indigestion after breakfast. Would not travel Virgin Premium Economy again it is not the standard of other airlines. Wow, what a bummer. Sorry to hear that. This wasn’t my experience at all. Maybe it was an off flight. Yes. I quite agree. It’s such an upgraded experience. I must admit that this sounds good. However, one alternative worth investigating is Air France’s Premier Voyager, which sounds much the same as this. We have flown it three times and will be taking it again from LA to South Africa via Paris; ticket was $2k each round trip. That said, I was initially inclined toward VA, but the AF schedule wad my wife’s choice. Definitely interested to hear this! Thanks for sharing!Very good to know. Hope you’ll come back and see us again soon! Hmm well you may end up with a great deal but you do run the risk of them being booked. Either way have a great trip. just booked pe for 1st time for my trip to Miami in November with Virgin. Additional £400 for return trip. Very excited! Thanks for the insight! So happy you found the post helpful! Let us know what you think! The most interesting comment here is the reference to the inconvenience of a seat fully reclined immediately in front. This sounds like a disaster. I had a horror trip with BA from London to Rio where the seat inn front was fully back on the runway and made it impossible to read, eat etc and even intervention of the cabin crew only gave relief for 5 mins for a meal, than back again spilling wine food etc. I would question if it’s worth the money unless you are happy to operate at a slant for the whole trip. Good review, but be kind to those behind you. If someone asks you to refrain from reclining your seat, it’s for a good reason. Your comfort does not exceed someone else’s. Just stay upright people. Yes but it is like dominos haha. Once the person goes down in front of you there isn’t much of a choice! My partner and I tried it out just the once and now…. We always fly Premium Economy. I find Upper Class would be extremely difficult to justify – it’s great if travellers have a Corporate agreement and they aren’t forking out the money from their own pocket. For the rest of us, I think it’s a superb way to start and end your holiday with all those little extras, you do feel a little spoilt and for just a few hundred pounds extra. I’m an absolute stickler for good customer service above all else, bad customer service, wow you’re going to know about it, And no, I’m not a difficult customer waiting for a chance to pounce, however give me the slightest attitude and I shall reciprocate by the BUCKET LOAD . The Cabin crew are attentive without making the experience feel forced and insincere. Now one thing I MUST mention, my partner is a Yorkshireman and fits the stereotype perfectly – he’s tight. So, there’s the best endorsement Virgin could wish for hahaa.. Thanks so much for sharing your experience! Super helpful!! thank you so much for great review def be booking virgin prem econ on next flight, went on seat guru and found its got the widest seats of any airline for this class, so another plus there, just flown Singapore econ and after walking past premium econ could have kicked myself for being to tight to fork out extra, on long haul well justified, after a great hol you don’t want your last memory to be be a lousy flight. Thanks so much for stopping by, happy you found it helpful! The only seats left are middle and bulkhead….Is Economy that bad? We’ve just booked our flights for January, flying to JFK. Will try Premium Economy for the first time and after your write up Kate, we are really looking forward to it. Interesting thread. I primarily book PE for the increased recline. 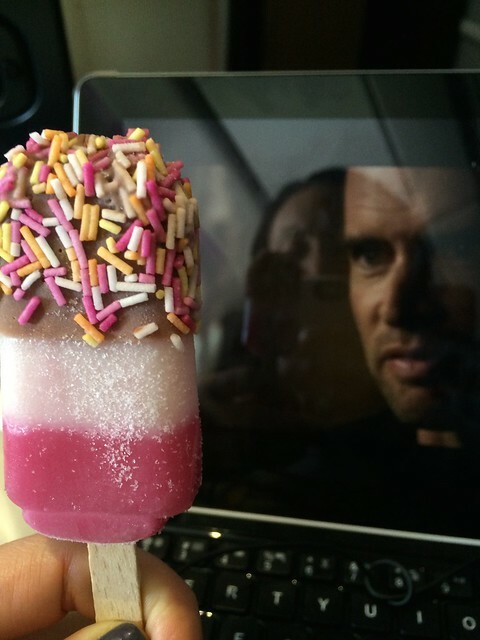 For anyone to suggest I then forgo this benefit for those in the seat behind me? Did they book it for the toothbrush??? Thank you for the review, are there any more recent? Doing daytime flight in February.